On Tuesday morning, my husband and I went to the Rec Center to work out, as we often do in the winter when it gets too cold to run outside. He was driving, and he said that he would drop me off at the front door if I wanted, but that he expected I’d probably want to walk in from the parking lot together as usual. Although the weather was unusually cold, I was about to say, just out of habit, that I was fine with walking in. Then it occurred to me that he was trying to do a kind deed, so I should accept the offer—and in fact, I did appreciate not having to walk across the snowy parking lot. Kindness is as much about letting others be helpful as it is about doing good deeds! So nice, generally we don’t think about it, accept kindness is not always easy. Yes, we imagine that we have to do everything ourselves, but we don’t really. So true. 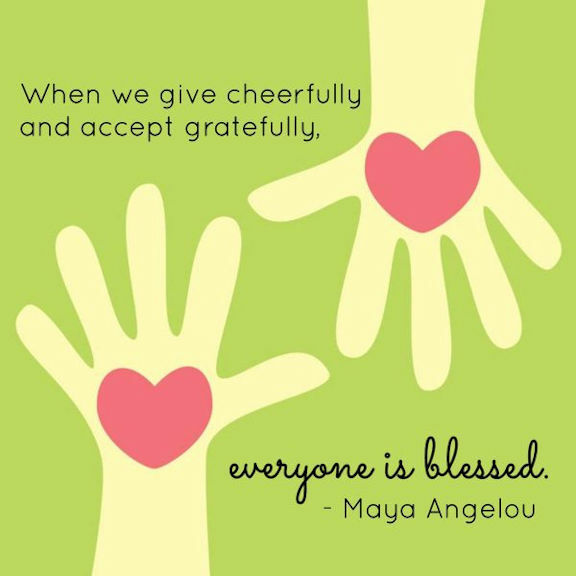 Giving joy to others by accepting gracefully is also necessary. It really is! Thanks Indira. It is true — important to remember and appreciate the giver/the offer!